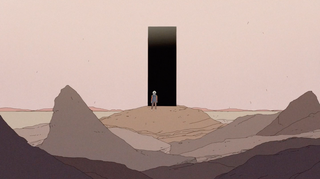 “Echoes” is a (very short) short film from Naleb, which shows an astronaut’s disastrous encounter with a mysterious portal. As usual, you want her to just turn back, while simultaneously knowing she can’t. What really works here is the style and the brevity. “Echoes” is so short, it doesn’t have time to wear out its welcome or get bogged down in unnecessary details. It’s also got a style that screams of a picture book brought to life, turning into a fable.